New York Times and worldwide bestselling author Isabel Allende returns with a sweeping novel that journeys from present-day Brooklyn to Guatemala in the recent past to 1970s Chile and Brazil. An instant New York Times bestseller, In the Midst of Winter is about three very different people who are brought together in a mesmerizing story that offers “a timely message about immigration and the meaning of home” (People). During the biggest Brooklyn snowstorm in living memory, Richard Bowmaster, a lonely university professor in his sixties, hits the car of Evelyn Ortega, a young undocumented immigrant from Guatemala, and what at first seems an inconvenience takes a more serious turn when Evelyn comes to his house, seeking help. At a loss, the professor asks his tenant, Lucia Maraz, a fellow academic from Chile, for her advice. As these three lives intertwine, each will discover truths about how they have been shaped by the tragedies they witnessed, and Richard and Lucia will find unexpected, long overdue love. Allende returns here to themes that have propelled some of her finest work: political injustice, the art of survival, and the essential nature of—and our need for—love. "A timely message about immigration and the meaning of home." "It’s when revealing the characters’ harrowing past lives in other countries that the generous and unflagging energy that characterized Allende’s debut, The House of the Spirits, can most clearly be felt." "Allende uses imagination to help readers gain a better understanding of what the immigrant experience is really like for many people in this country." "Devotees of Allende’s forays into magical realism (The House of Spirits, The Stories of Eva Luna) will find the universe she creates here—an account of earthly lives lived in an earthly setting—more madcap and macabre." "A syntactically beautiful story with the twists and turns of a telenovela and warmth at its center." "Allende's latest tale is heartfelt and raw... The interactions between the characters is well thought out and deep. Readers will come to love them and experience the heartbreak and joy both of their past, present, and future." "The lesson is clear in both book and life—passion is possible. So is survival and change and making a difference in the world, in Isabel Allende’s grand and inimitable style." 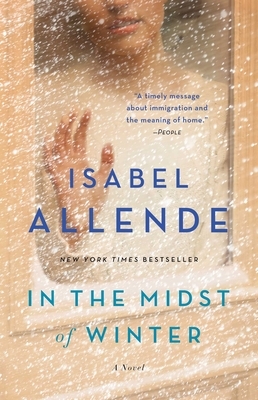 "Isabel Allende brings her poetic and compassionate eye to In the Midst of Winter, [which] is being compared with her masterpiece The House of the Spirits." "Isabel Allende’s masterful blend of history, suspense, and rising passion makes for yet another riveting novel." "The contrast of a modern-day mystery with the characters' magical worlds of South American culture, makes In the Midst of Winter an absorbing, page-turning adventure." "[Allende] continues to beguile readers with themes of social justice and love, tied together with a bit of magical realism. In this vivid and fast-paced work of fiction, [she] weaves a suspenseful love story, rendering [its] central trio with generosity, spirit, and passion." "Filled with Allende's signature lyricism and ingenious plotting, the book delves wonderfully into what it means to respect, protect, and love." "Allende has a rare and precious gift for simultaneously challenging and entrancing readers by dramatizing with startling intimacy such dire situations as the desperation behind illegal immigration and domestic violence, then reveling, a page later, in spiritual visions or mischievous sexiness or heroic levity." "This winter's tale has something to melt each frozen heart."